The wonderful autumn season contains many things that remind me to fill my heart with gratitude—things like delicious little maple pecan scones, those amazing colors in the early evening sky, and the changing leaves that drift to the ground, all of those simple yet precious things that bring meaning and perhaps some fresh perspective. My heart leaps with joy at the sweet little changes that my beloved autumn season brings in with it. Changes in the light, as it increasingly blushes a golden-orange with little tinges of bluish-purple in the evenings; changes in the temperature, which becomes cooler and more refreshing, and ever-more conducive to wearing light sweaters or hoodies on those night-time walks around the neighborhood with the dog; and changes in the dishes that I enjoy, as I begin to crave more and more those things that bring cozy comfort and help me to immerse myself in the spirit of the season. I adore the treats that the fall inspires, as they so very often are mingled with warm spices that invigorate the body, or rich, buttery sweetness from seasonal staples such as maple, brown sugar, and vanilla. 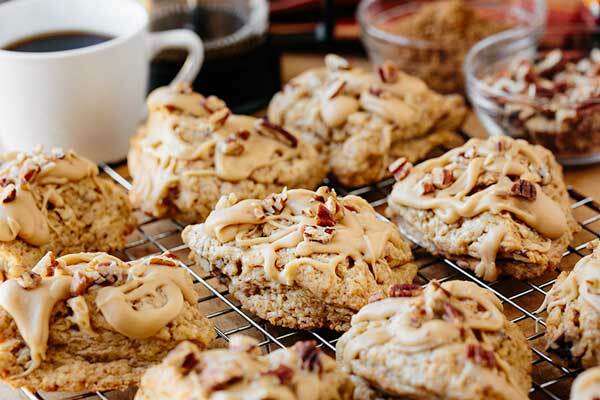 And maple pecan scones, the tiny little wedges of delight that offer up little nibbles of “pecan-y pleasure”, are just the right treat made very simply from scratch that remind me to savor every moment of my favorite time of year, and enjoy each and every day with as much consciousness and gratitude as I possibly can. All of the many sweet little “bites” of fall—the changing color of the leaves, the pumpkins, the whispering breeze, the freshly-baked goodies—are there to enrich the experience of this time of year, to bring in some fresh perspective; they are there to help me to remember that there is nothing more important than love, togetherness, and expressing joy for the gifts that I have in my life. Both that unique, peaceful “quietness” of the fall along with that feeling of gleeful festivity found in it are there to offer up opportunity for either contemplative reflection of life, or for simple bliss in seeing those around me have a wonderful time fully enjoying and being playful in the activities of this time of year. All of this is a chance to be inspired and to be thankful for all of those sweet little bites that surround, and that become undeniably apparent in the glorious beauty that the autumn contains within it. -Preheat your oven to 375°, and line a baking sheet with parchment paper or a silicon mat (my preferred method). -To a large bowl, add the flour, baking powder, brown sugar, and salt, and whisk together to combine. -Add in the cold butter, and using either a pastry cutter, forks, or even your fingers (my preferred method), cut or crumble the butter into the flour until it becomes tiny, pea-size pieces. 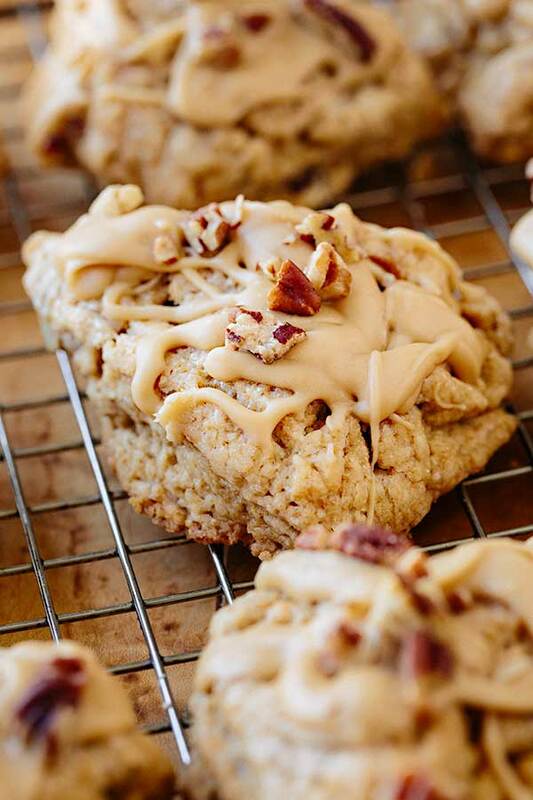 -Next, add in the 3/4 cup of heavy cream, the vanilla extract, the maple flavor, and the chopped pecans, and using a wooden spoon, combine until a slightly sticky dough comes together. -Turn the dough out onto a work surface, and using your hands, bring the dough together until it forms a ball (it may be a bit crumbly, but that’s OK—it’ll come together well enough); cut the dough ball in half to create two, smaller pieces of dough. -Shape the first piece into a disc about 1” thick, then cut it in half; cut each half into three wedges (you will have 6 scone wedges per disc); repeat with the other piece of dough. 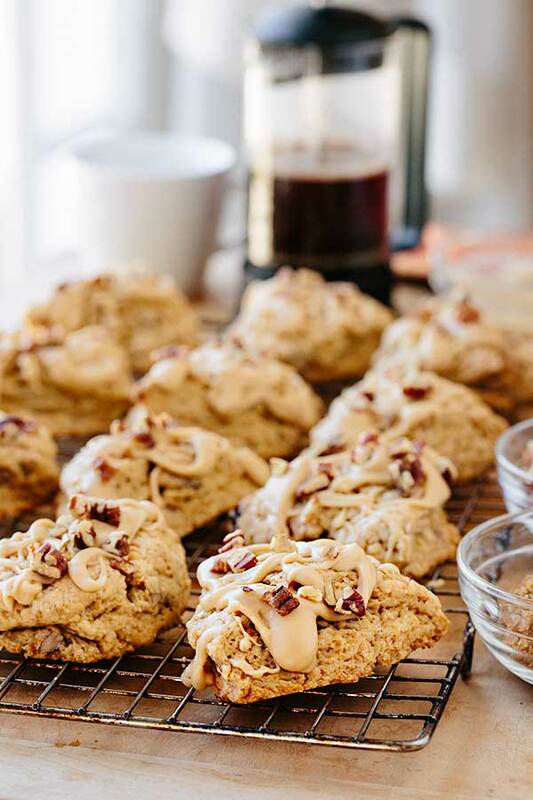 -Place the 12 scone wedges onto the prepared baking sheet, and brush the tops of each with a little of the remaining tablespoon of the cream; bake for about 20-22 minutes, until slightly golden. 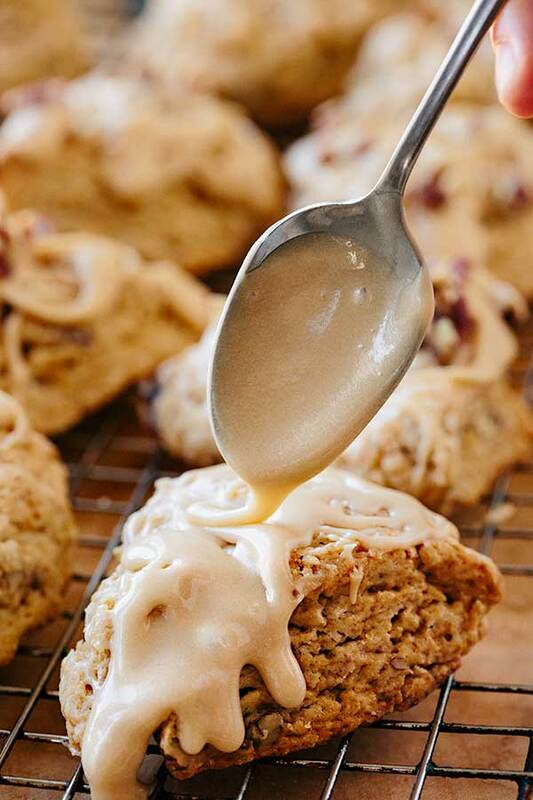 -Allow the scones to cool completely, then drizzle over each some of the Maple Glaze, and sprinkle over some of the remaining 1 tablespoon of the chopped pecans; allow the glaze to set up before enjoying. -In a bowl, whisk together all of the ingredients until completely smooth; use immediately, or keep covered until ready to use, at which point just re-whisk to blend once again. recipe and sharing these bits of Autumn with my neighbors. Deborah, thank you so much for such a kind and thoughtful comment! It means a lot to my hubby and I. 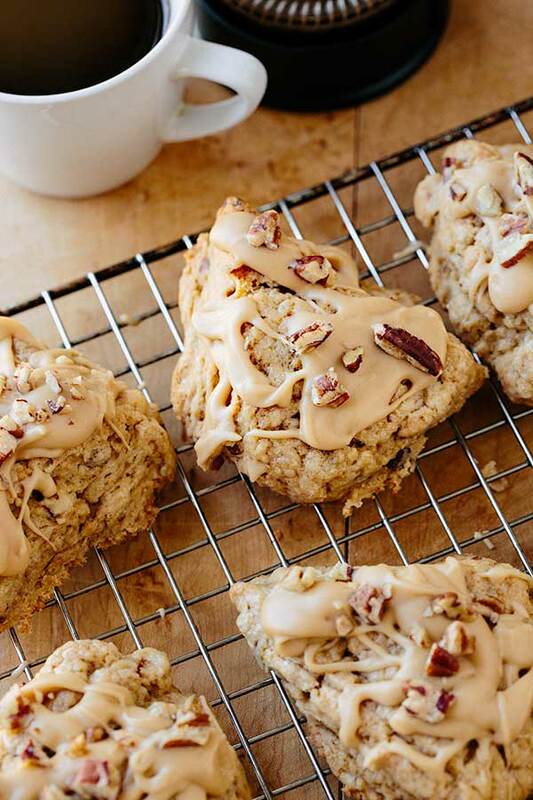 We are blessed to have your readership, and my hope is that you enjoy making and sharing these sweet little scones! Thank you for stopping by! I agree with you wholeheartedly Deborah. I just found this link when I was looking for a soup recipe. I also Iike that Ingrid is from European heritage. I hope she posts some Recipes passed down from her family. Connie, that is very sweet of you…thank you!